It appears that Indian stock traders are rejoicing the booting of Srinivasan from BCCI as stock chart never lies. They feel that now Srinivasan will be able to give more time to the company. Well it needs to be seen but for the time being stock is in uptrend since Srinivasan has been booted out of the Cricket board of India courtesy Supreme court of India. As we can see that India Cements Limited has broken the resistance at the level of 62 and now it is going to be a rock solid support. The stock is overall assessed as technically positive for the medium long term. 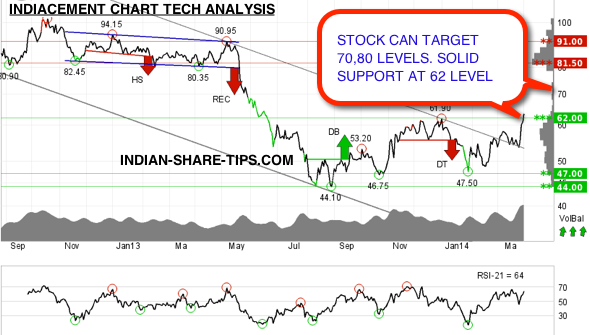 In its uptrend stock can target 70, 80 and 90 levels.